Georgia State softball is gearing up for another season that could be somewhat of a challenge for some of the players on the team. With last year’s stars, Ivie Drake and Megan Litumbe, gone because of graduation, the returning seniors look to take over as the new leaders of this team. Head coach Roger Kincaid described it as an “it’s your turn” mentality when talking about who is next up in the leadership role. “It is everyone’s responsibility to step up and provide leadership first for themselves and then their teammates,” Kincaid said. Although softball only plays four exhibition games this fall, he trusts that his team will be acclimated with one another. Frady also believes that these games are a great thing for the players to get back into the swing of things. “The fall games give us the opportunity to integrate the newcomers into our new system as well as see how they will react to game situations,” Kincaid said. Senior outfielder Reagan Morgan also believes that the fall games mean a lot for the team. “It is especially important this year because we have seven freshmen who are new to the team, so these games are a way to get comfortable playing with each other and to build team chemistry,” Morgan said. She also recognizes that Litumbe and Drake were respected because of them leading by example on the field. Litumbe was an outfielder and left an incredible mark in the Panthers’ record books. Last season, she finished second in Georgia State history with 53 home runs, only behind Drake. Litumbe’s 2017 season was an amazing campaign. She set the Georgia State single-season record for home runs with 22, had the highest slugging percentage in a single-season with .826 and recorded the fourth most RBIs in a single season with 60 in both 2017 and 2015. Morgan knows that being a senior on this team is very important because seniors set an example for the younger classes. Another senior that will have to lead by example is catcher and infielder Arden Jobe. Jobe is not only one of the leaders of this Panthers squad, but she’s the one to fill the void left by Drake. She has no problem stepping in after the generational talent. Drake had an even more illustrious career in her four seasons at Georgia State than Litumbe. Only Drake hit more home runs, 65, than Litumbe did in Panther history. 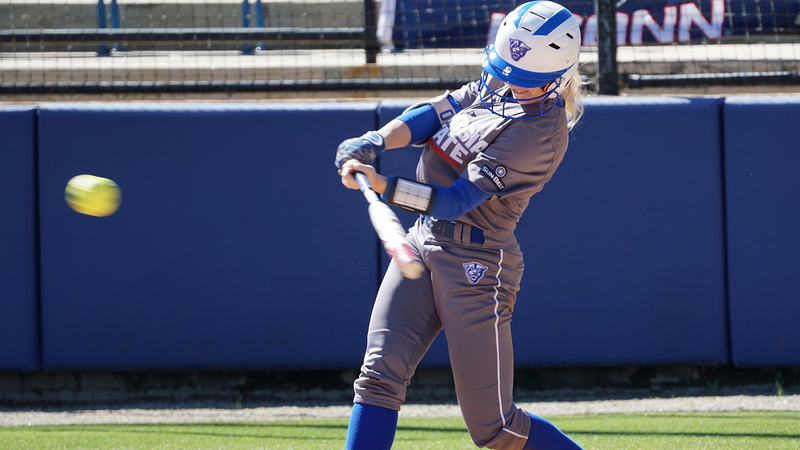 Drake completed her career first in the Georgia State record books with a .408 batting average and also in hits with 285. “I do not think that we will have a problem filling their shoes from a leadership standpoint … Each senior brings a little something special to our team this year,” Jobe said. With the season coming soon and the Panthers preparing early for it, they look to conquer their conference and get what is most important to them, a Sun Belt Conference championship.